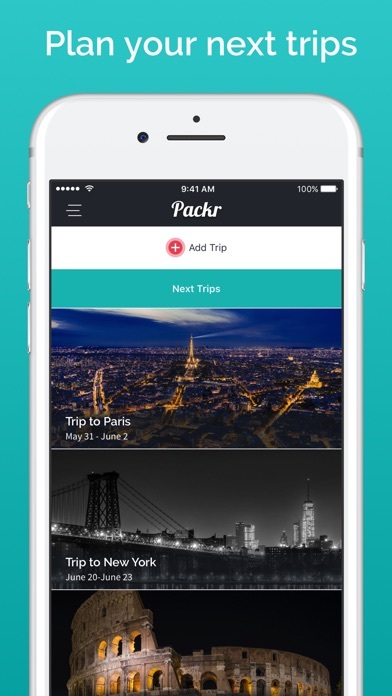 Save time before going on a trip with Packr! 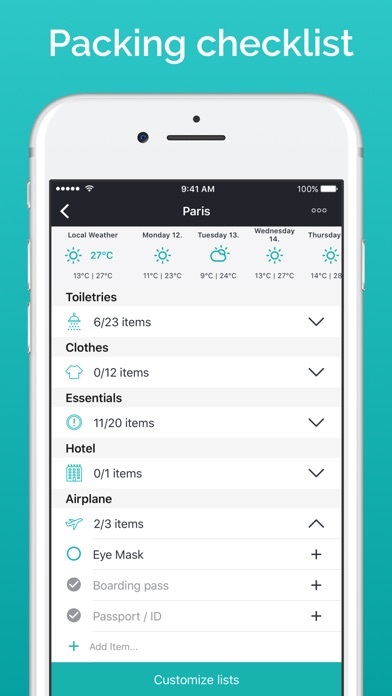 Packr will help you pack your suitcase for each trip. The packing list is based on your destination (city, country or region), travel dates and activities. ◆ PACKING CHECKLIST ◆ Packr creates a packing checklist for your suitcase from 24 pre-defined activities. Based on length of stay, weather and planned activities, your packing list will be ready in no time. This is the perfect tool for your summer vacations, long week-ends, road trips and even camping. ◆ LESS STRESS ◆ Every journey is different, each traveler has his own habits. 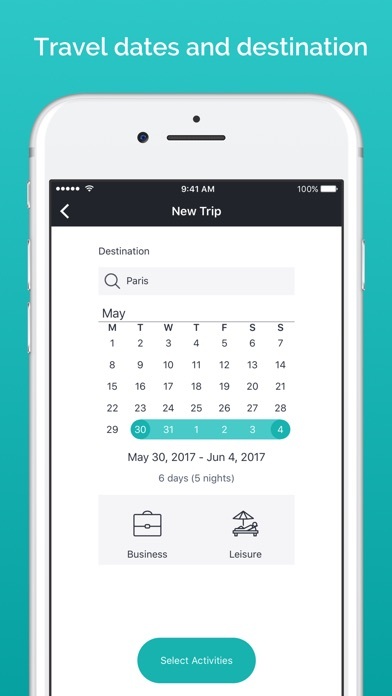 Packr learns from each of your trips to organize the packing checklist, and adjusts the items based on your previous trips. You will never forget to pack THAT thing again ! ◆ BETTER PREPARED ◆ A quantity can be set for each item, some items' quantity will be automatically adjusted to the length of your stay. You can also create your own packing lists. 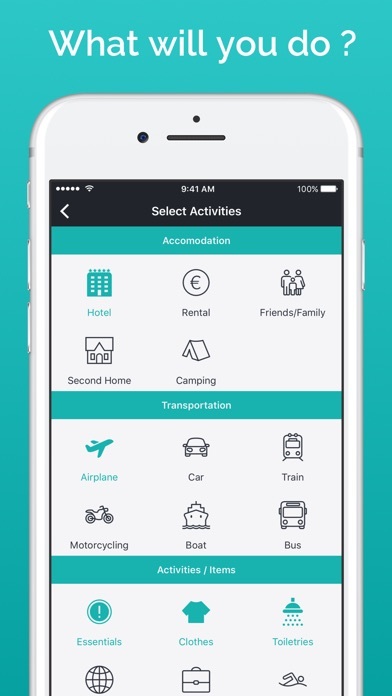 ◆ PRACTICAL FEATURES ◆ Premium users can synchronize trips on all devices such as iPhone, iPad and iPod Touch. You can also share the checklist with your travel companions or print it out. Packr has already travelled several thousand times around planet Earth packing over a million items in each traveller's suitcase. 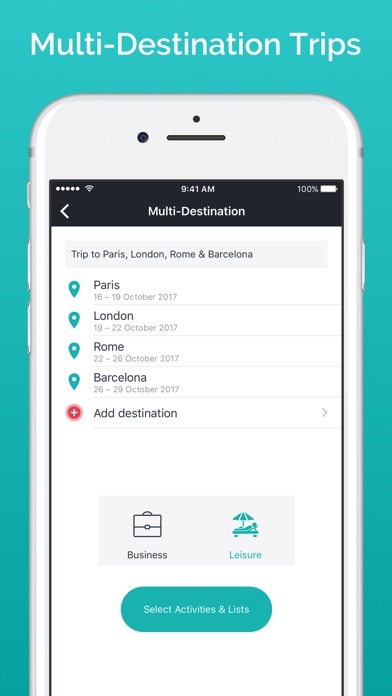 Packr has been used for trips to cities like Paris, London, Barcelona, New York City, Montreal, Berlin, Majorca... And countries like France, United Kingdom, Spain, Greece, USA, Italy, Canada, Germany and 1000+ more locations. I went ahead and purchased the full version, and it was the worst mistake. If you are reading this, don’t waste your time or your money. Good app, but why is there no offline mode? The app is so well organized and easy to use. You can easily add or remove items from the list they start you with. There are different categories for each type of object you might need to bring. You can adjust it to show all or only tasks left to do. I never leave reviews, but this was so perfect. I purchased the app for 1.99 to connect to trip it. Everytime I update my packing lists, it goes to the home page and everything goes back to the way it was before I edited. This app is garbage and I don’t understand how it has great reviews. This app thinks of everything. You tell it where you’re going and for how long and it gives you the most thoughtful packing list ever. It thinks of every single thing you may need for your trip! I highly recommend it!! Travel never was so easy since I started using this App!!! Not working right. Do not save changes in lists. Great app but I wish you could make it so that you could edit the list when you wanted to instead of being able to delete an item at any moment other than that no complaints great app.